John C. Reilly as Cal Naughton, Jr.
Pat Hingle as Mr. Dennit, Sr.
Greg Germann as Larry Dennit, Jr.
Ricky Bobby (Will Ferrell) was born going 100 miles an hour so it was only natural that he became a racecar driver where he lives by his daddy’s motto ‘If You’re Not First, You’re Last!’ Of course his daddy (Gary Cole) is an alcoholic, pot-dealing hobo, so maybe that wasn’t the best role model he could have picked, but what the hey. As his wife (Leslie Bibb) points out Ricky is a driver, not a thinker, and that philosophy serves him pretty well – except for the part where it gives him a swelled head and leads him to take everyone around him, particularly his best friend Cal (John C. Reilly), for granted – until an effiminate but highly skilled French driver (Sacha Baron Cohen) comes looking for him like some kind of gunslinger from the old west… but in the present day… and with cars. “Talladega Nights” is the second big screen collaboration between Ferrell and director Adam McKay and like it’s predecessor “Anchorman” it is generally a madhouse, but in a very good way. McKay and Ferrell’s film making style is somewhat similar to Christopher Guest’s or Mike Leigh’s, beginning with a script but adding to each scene with extended, and usually on the spot, improvisation that leads to some brilliantly absurd exchanges like Cal’s confession that he posed for Playgirl in his 20s and a debate over which Jesus Ricky should pray to, and even better outtakes over the closing credits where Ricky and Cal try to raise money to stop snowblindness in cats. As with all improv it’s hit and miss. Somethings work really great and some fall flat and go on too long. The film takes great joy at satirizing sports film clichés; particularly the ones having to do with family and self-respect. Ricky Bobby is on top of the world until a horrible crash forces him away from the track, not because of any tragic nerve damage he has sustained but because he believes he has sustained it, convincing himself for a time that he is actually paralyzed. It also pokes vicious fun at America, the rural south, the fascination with NASCAR and speed in general, and our love of winning and general disregard for losers. After his wreck, Ricky quickly loses his job, his wife and his best friend and finds himself for the first time in his life afraid to get behind the wheel of a car and only his belligerent, deadbeat, completely amoral father can help him. Some actors are better at this type of performance than others with Ferrell, Reilly and Cohen going overboard in every scene they have. Michael Clarke Duncan and Amy Adams get left in the background for most the film, though even they get a few really good bits. There is often the feeling that lots of great improv was left on the cutting room floor in order to keep the running time down. But that’s all right, because what’s on screen is funny as hell. This kind of long running absurdist humor is what Ferrell does best and “Talladega Nights” plays to his strengths. Where a lot of films of this type feel like a comedy sketch drawn out long past being funny, “Talladega Nights” keeps working all the way up the end without dropping its ironic and absurdist tone, and ends up being not just a good comedy but a fairly satisfying sports film as well, neither of which is that easy to do. 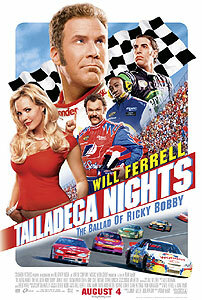 You pretty much have to like Will Ferrell to like “Talladega Nights,” it’s his film through and through. But if you do, you’re in for a ride.